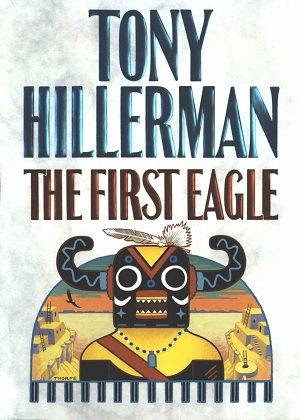 This is the first edition hardback of The First Eagle, which is the thirteenth Tony Hillerman Navajo Mystery novel featuring Joe Leaphorn and Jim Chee of the Navajo Tribal Police. This 1998 edition was published by HarperCollins Publishers Inc. in New York City, New York. The cover art was designed by Peter Thorpe, who designed a majority of the American covers for Hillerman's novels. This edition's cover features a kachina masked figure, which somewhat resembles Ahote kachina, standing in front of a half moon shaped frame containing a Pueblo cliff village and an eagle swooping through a southwestern sunset. Binding: Grey boards with a black spine and the kachina mask from the front cover embossed in light blue on the front board. The author, a circle, title, and publisher's logo printed vertically in light blue on the spine.